Our Pittsburgh-based railroad and FELA lawyers represent injured or killed railroad workers and their families in FELA claims, and people and families whose loved ones have been injured or killed in railroad crossing and train derailment accidents, in Pennsylvania, West Virginia, and Ohio. Based in Pittsburgh, we represent railroad workers (locomotive engineers, conductors, brakemen, signalmen, yardmasters, maintenance of way workers, and trainmen), and their families, in Pennsylvania, West Virginia, and Ohio, who have been seriously injured or killed by the conduct of railroads. We sue railroads and third parties under the Federal Employers’ Liability Act, or FELA, and other laws. We are familiar with the FELA, related federal statutes such as the Locomotive Inspection Act and the Safety Appliance Act, as well as pertinent safety-related regulations issued by the Federal Railroad Administration. We also represent motorists and pedestrians injured or killed in serious railroad track crossing accidents, and derailments. Having been deeply involved in personal injury litigation for collectively more than 40 years, we understand the medical issues surrounding the injuries that can happen in these types of accidents, particularly orthopedic and neurologic issues. We also know how devastating, both economically and emotionally, it can be to lose one’s ability to earn a living. Q: I’m a railroad worker and was injured on the job. Is my work-related injury covered by workers’ compensation? A: No. As opposed to the majority of workers in the U.S., when a railroader is injured on the job, federal law, a statute called the Federal Employers’ Liability Act (“FELA”), governs the railroader’s right to compensation for his or her injury. A: Congress passed this special federal law in 1908 to protect railroaders due to the dangers of working for the railroads. Under the FELA, a railroader injured on the job can file a lawsuit seeking to recover, among other things, his or her past and future lost wages and benefits, past and future medical expenses, past and future pain and suffering, and past and future loss of enjoyment of life. Q: Do I have to prove the railroad was negligent in my FELA case? A: Generally, yes. Unlike “no fault” workers’ compensation laws, the railroader in his or her FELA case must prove that the railroad was negligent — in other words the railroad failed to provide a reasonably safe place to work. In an FELA case, however, the burden of proof that the railroader has to shoulder to win his or her case is less than in a typical non-FELA negligence case, such as cases involving a slip and fall on a sidewalk or a car accident. This is often described as a “featherweight” standard. In fact, the railroader only has to prove that the railroad was negligent in some manner and that the railroad’s negligence played a slight role in causing his or her injury, which standard is very favorable to the railroad worker. In sum, it does not matter that the railroad’s negligence is relatively minor compared to the injuries suffered. As explained further below, however, in some situations the railroader does not even have to prove the railroad was negligent. Q: What happens if I contributed to causing my injury? Q: How long can I wait before filing my FELA case? A: The statute of limitations, which sets the deadline for when you have to file your lawsuit, is three (3) years under the FELA. Nevertheless, if the injury arises from an occupational disease that might take years to show up, the railroader must file the claim under the FELA within three years from the date he or she knew or should have known in the exercise of reasonable care that the occupational disease was related to their working for the railroad. Regardless, we recommend you not wait this long. As soon as you are involved in an accident or believe you may be suffering from a work-related illness, we recommend you contact a lawyer immediately. When people wait to file a lawsuit, documents tend to disappear, memories fade, and the scene of the accident may change. How long can I wait before filing my FELA case? Q: Can my spouse file a loss of consortium claim if I am injured? A: No. The FELA does not permit “loss of consortium” claims. Q: Can I file a lawsuit under the FELA on behalf of a deceased railroader? A: Yes. The FELA permits a personal representative of the deceased railroader to file both a survival action and wrongful death action against the railroad. If you or others are injured, call 911 for EMS and, if applicable, local or state police, sheriff, etc. If no EMS/hospital treatment is obtained, see your own doctor or hospital Emergency Room ASAP, as your medical condition indicates. Get photos, even with a cell phone camera, of the accident scene, vehicles, equipment, products, involved. If possible, preserve the accident scene and any vehicles, equipment, or products, involved, until it can be investigated. Write down the name, address, and phone number of all witnesses. Immediately report the accident orally and in writing, describing the highlights of how all persons, vehicles, equipment, and/or products played a part. Try to avoid discussing the accident or giving a written or recorded statement until you have the opportunity to talk to your lawyer. You can call G&O 24/7 toll free at 1-877-404-6529. 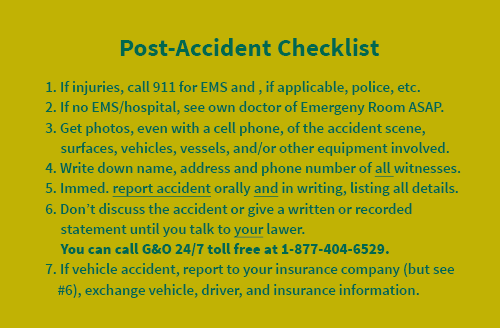 If a motor vehicle accident, report it to your insurance company (but see #7), exchange vehicle, driver, insurance information.